Meat lovers this one is for you. 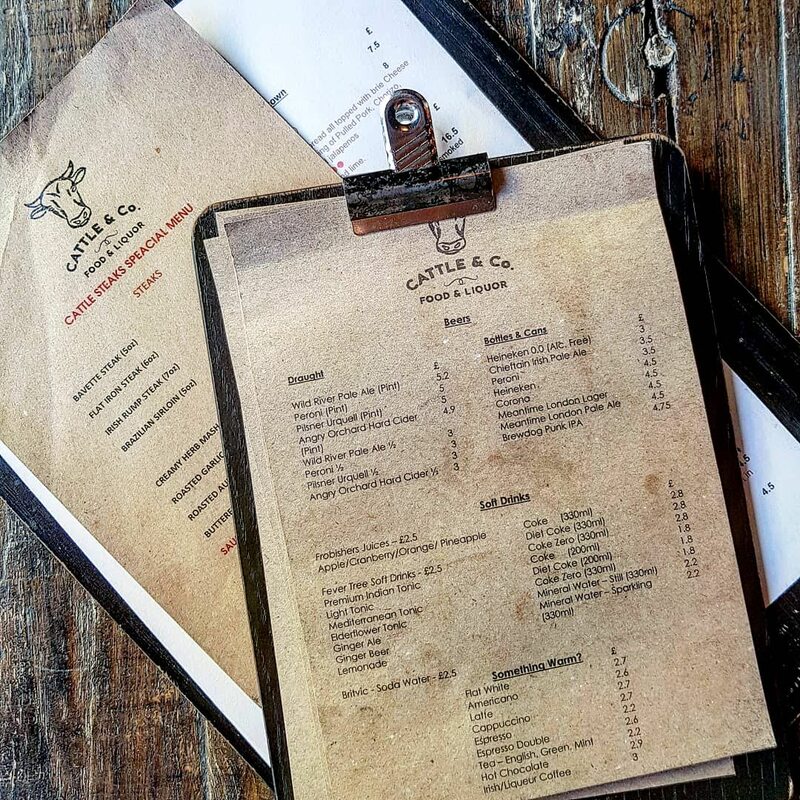 Cattle & Co. is just off Euston Road, the main road connecting Euston and Kings Cross. It’s pretty big, with an outdoors space too. The inside is contemporary, dark and minimalist. It gives off a relaxed steak-house/ranch feel. The team were all friendly from the get-go. We got seated away from the family buzz and the hyperactive little ones, showing they really were thinking about us. A nice little quiet corner by the window made for a comfortable place to enjoy the end of our busy day exploring. 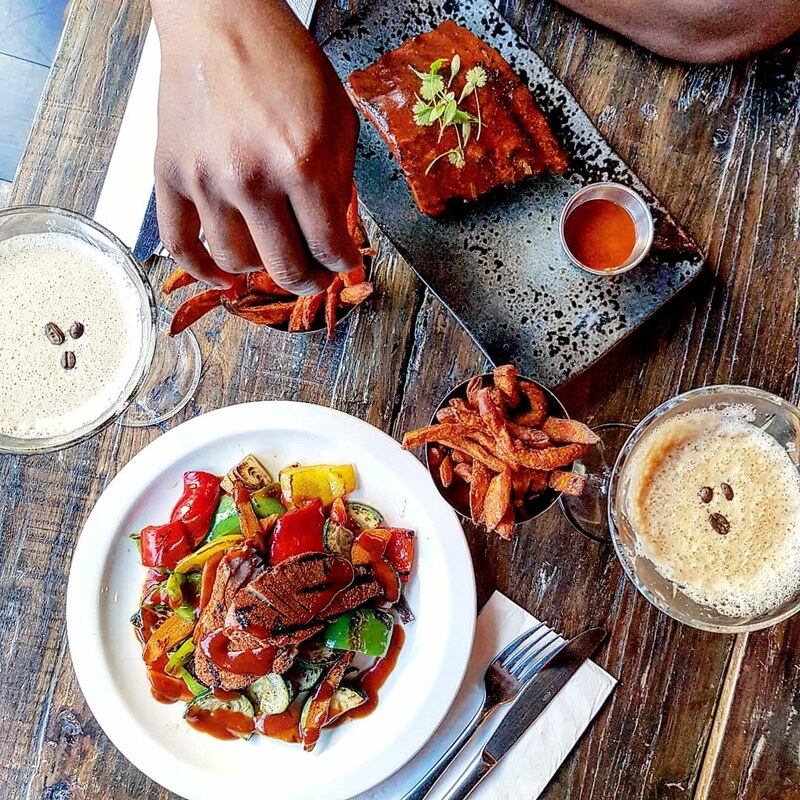 Whilst this is definitely a place for the meat lovers, the menu doesn’t just feature meat. 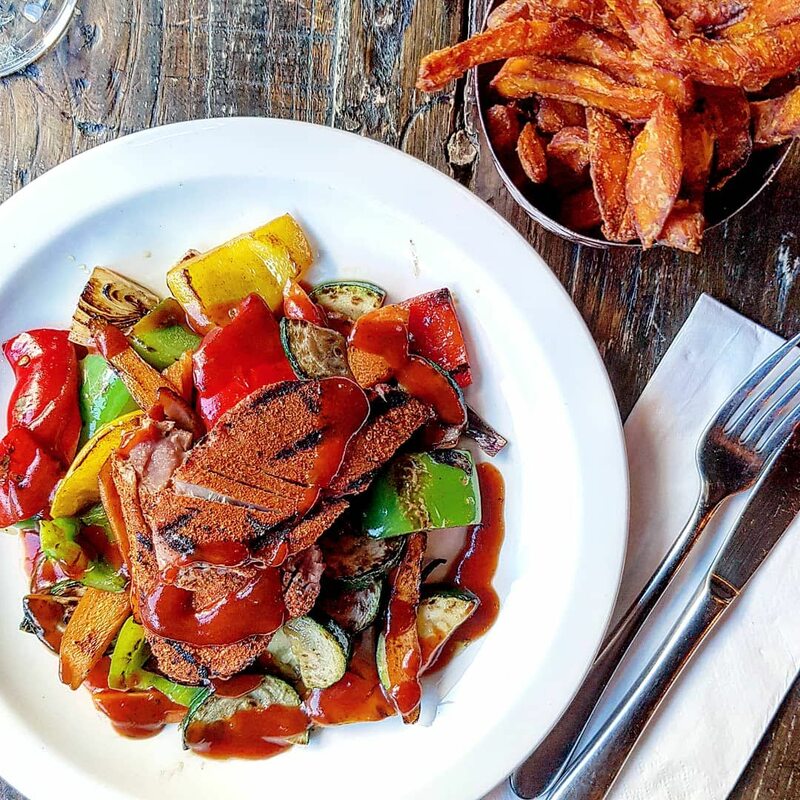 Alongside the pulled pork, steak and burgers, there’s also blackened cod, tuna steak and veggie options too. So plenty for all. The sides keep true to the American influence, with mac and cheese making the cut, along with a variety of fries and onion rings. The starters section isn’t as extensive but still enough choice, with buttermilk wings and cauliflower cheese balls being just two of the six. 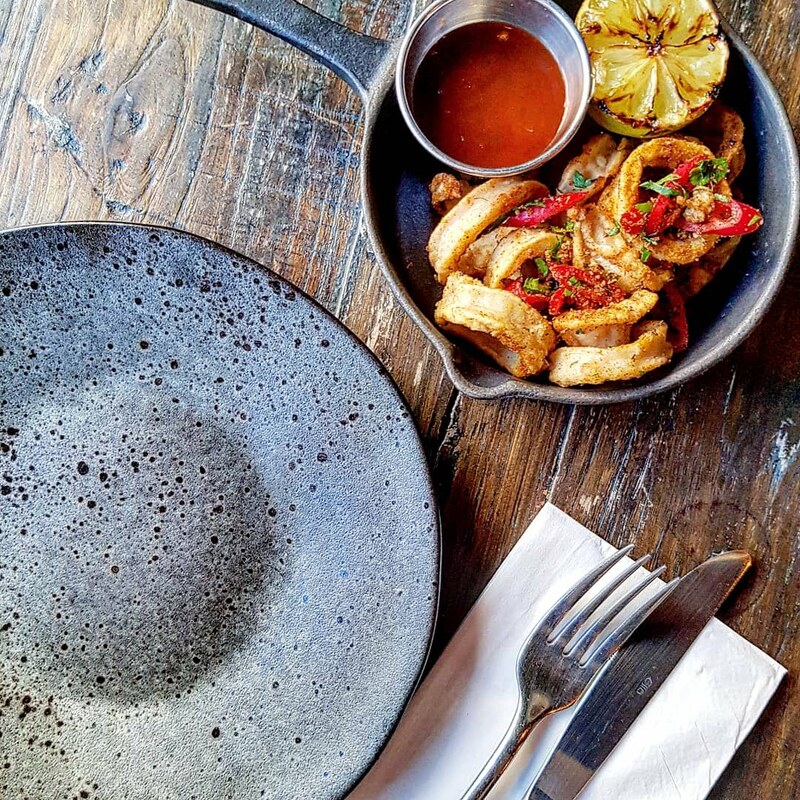 The Devilled Deep Fried Squid was lightly coated, served with chilli and spring onion. There was lemon too ofcourse, as no fish dish is complete without it. Each piece had a slightly spicy kick. They were a little more tough than squid we’ve had before. But the flavour made up for that. The dip on the side tasted like a tangy cross between a ketchup and a BBQ dip. It was delicious with the spicy flavours. Sharing a starter is the way forward here as, trust me, you don’t want to fill up before the main event. Going rogue, the Cajun Tuna Steak was absolutely delicious. It was cooked rare which enhances the flavour. The seasoning was potent but not overwhelming either so the fantastic flavours of the fish could come through. The bed of roasted vegetables the tuna came on tasted like they’d just come off the barbecue. Beautifully cooked. The BBQ drizzle spreading the flavour further throughout the dish. The sweet potato fries were good too. Crispy on the outside but still pretty fluffy and soft. It’s all too easy to get these wrong. Safe to say, I did not suffer even a tad of food envy. Although the ribs did look good. 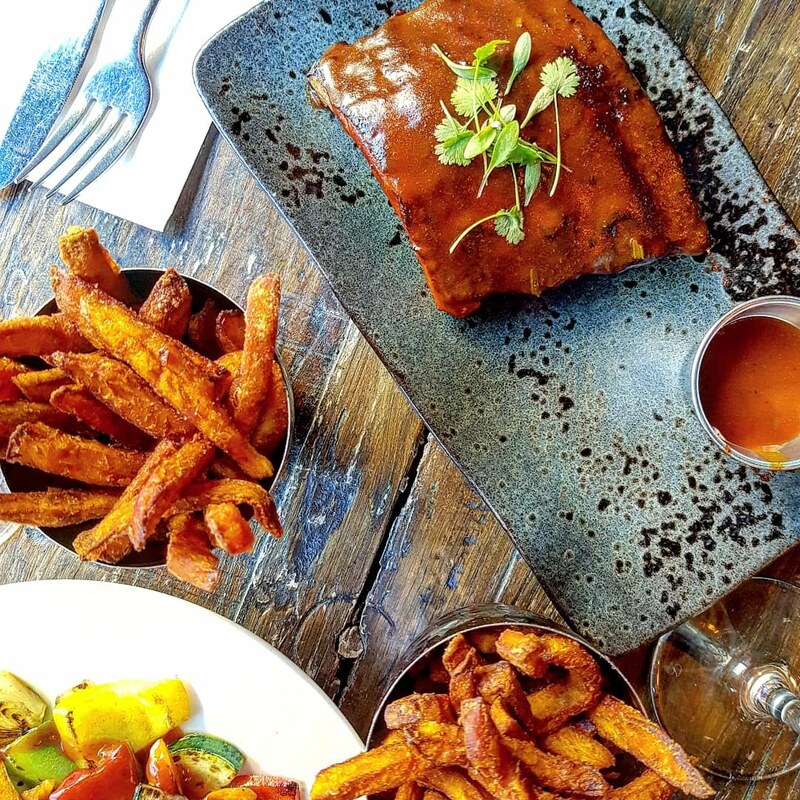 Pairing the baby back ribs with sweet potato fries, the choice from the starter menu can quite easily be turned into a main. The ribs were reasonably meaty, but actually pretty tough to bite or cut. Whilst they were tasty in flavour, the texture did let them down. I don’t think I’d order ribs again, but we’d definitely consider going back for something else! There is a dessert menu too, but we were too full to even look. However, having done a bit of insta-stalking, the deep fried Oreos look amazing – go take a look on the restaurant instagram page. 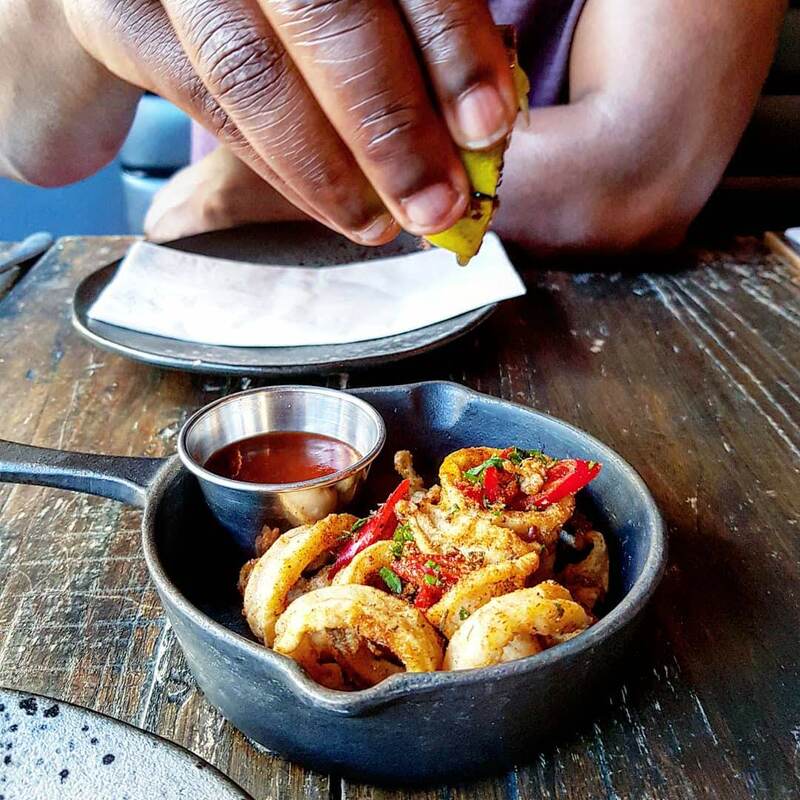 It’s a shame that snacking and late lunching meant we filled up too quickly. Of course, with all this food, you need drinks too. The drinks menu is dominated by cocktails, with a variety of classics and twists. 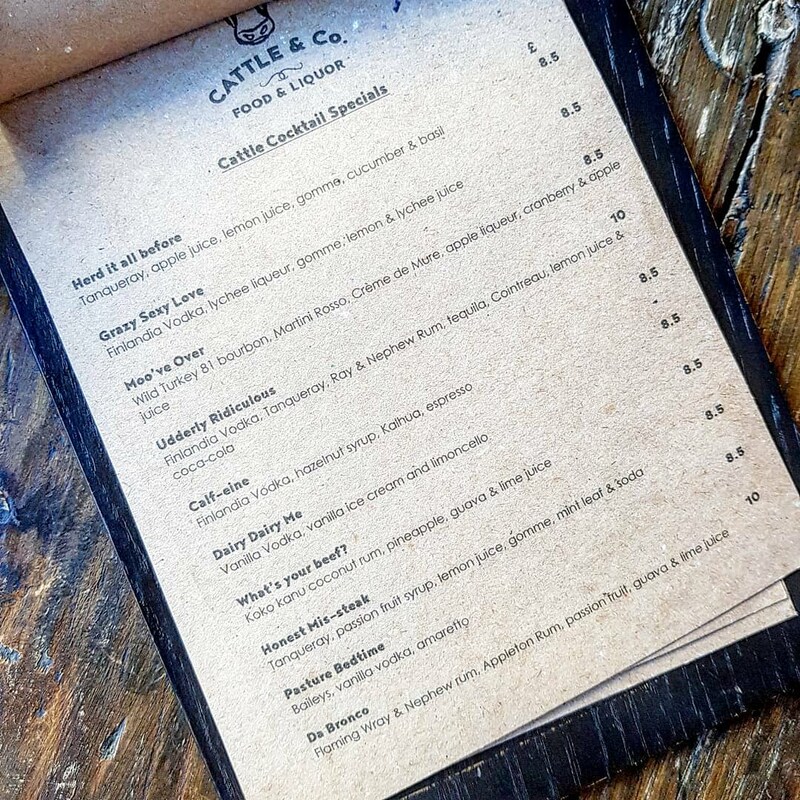 One of the cocktail menus even has funny names for each drink, including Moo’ve Over, What’s Your Beef and Honest Mis-Steak. There is beer, wine and soft drinks too, with plenty of options for all. 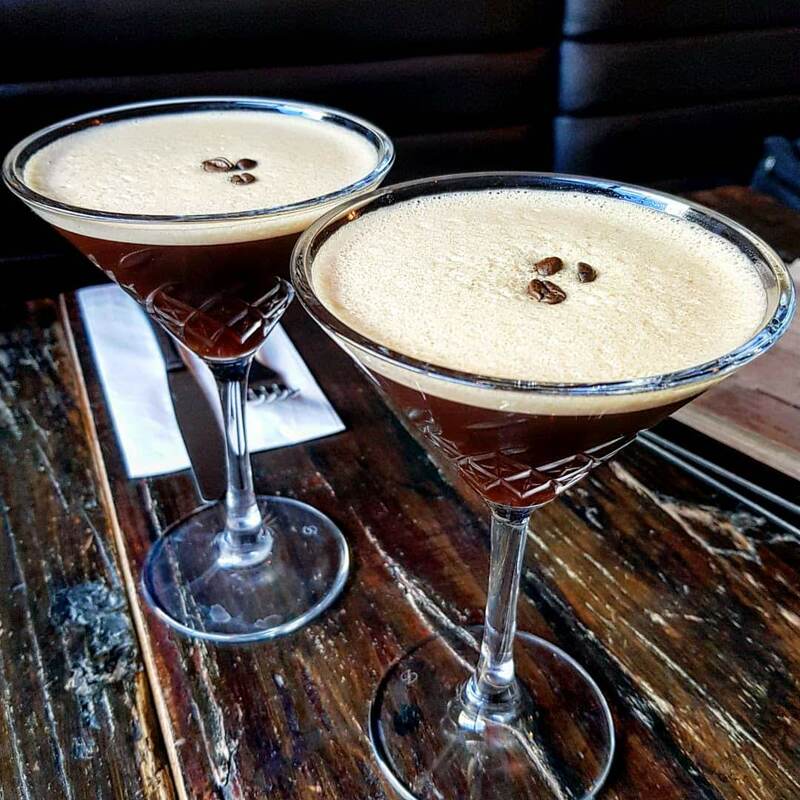 The Kalf-eine, Cattle & Co’s take on an espresso martini, consists of Absolut Vanilla, Vanilla syrup, Kahlua & Espresso. It’s verging on creamy, really strong and the coffee taste is delicious. One awesome espresso martini. Just the kick we needed over dinner to keep us going. Yes, we both had to have one as we couldn’t resist. We did stop at the one cocktail, but there were so many more I wanted. 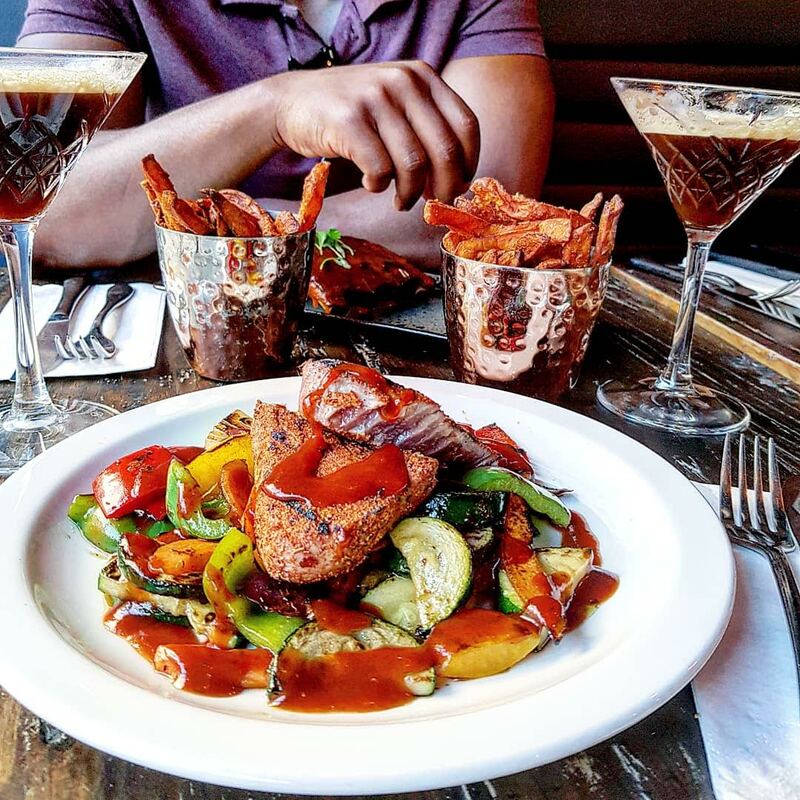 Price: Roughly £60 for two mains, a starter to share and two cocktails, including service. Pretty reasonable. 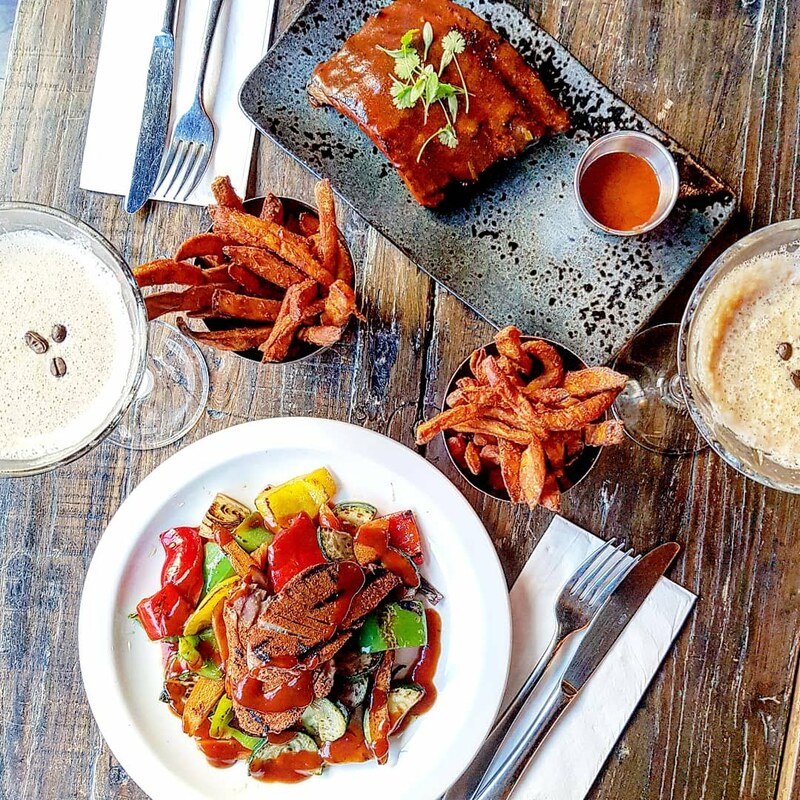 Food: We weren’t overly impressed with the ribs, but the cajun tuna was amazing. Definitely go for that! Drinks: Plenty of choice – cocktails (with funny names too), beer and wine, as well as soft drinks. Definitely recommend the Kalf-eine (espresso martini)! 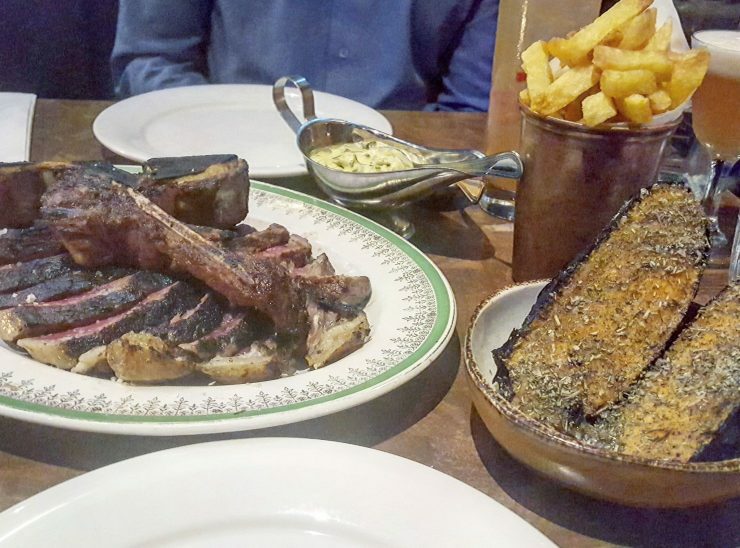 Atmosphere: Chilled, relaxed steak-house feel. Wait: No wait. Seated straight way on a Saturday evening. Service was friendly and quick. Where’s your fave meaty spot right now?